"America was well aware of the appeal of the mini-skirt, and of course everything was BIG. While jeans and t-shirts were emblazoned with colorful flowers and butterflies, the Redskinettes discovered sequins. And lots of them!" "The ladies reinvented the suede look and adopted the thin burgundy and gold headband as part of the uniforms this year. Still keeping the nostalgic feel of the classic Redskins look, but following the evolving 80s version of "punk" and coinciding with the new music generation of the MTV years, the Redskinettes stayed current... but still hung on to the white boots! The team wore this uniform for Super Bowls XVII and XVIII." 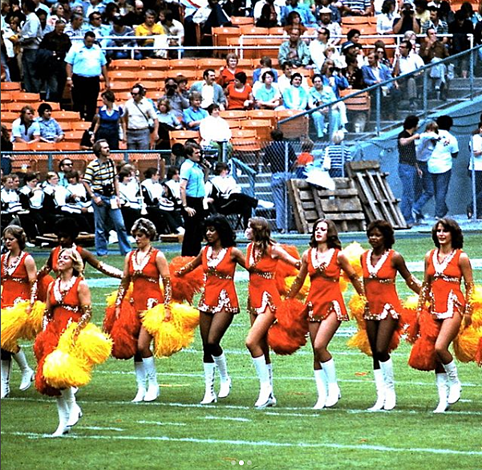 In the 90's, the Redskins Cheerleaders updated the classic fringed leotard below. "The ladies returned to their roots in a slinky and shiny one-piece uniform with delicate puffy sleeves to offset a short skirt." "This uniform evolved slightly every year! Each year the team adds a few rhinestones and cuts away a little more fabric. The fabulous results were seen on the sidelines during the 2003-04 season!" All images credit The Redskins Cheerleaders and the @1stLadiesofFB Instagram. Visit Redskins.com for the full history on the Redskins Cheerleaders uniforms!